First snows and the virtual house arrest during hunting season makes me want to get up and out and do something. For several years in the late 1990s I made evergreen wreaths five days a week during the months of November and December. Joel Podkaminer owns the Trumansburg Tree Farm and harvests Christmas trees to sell in New York City’s Green Markets. His wife, Tina, many years ago started the wreath-making from the scraps cuts from the harvested trees. Bouquets, garlands, swags. Tina has her own successful catering business (Word of Mouth in Trumansburg on Main Street). Joel hired seasonal wreath-makers to work in his heated garage at the bottom of a ravine on Taughannock Creek. My first wreaths constructed in 1996 were iffy, but I got better as a buncher. Much better. In 1999 I worked on two wreaths that were eight feet in diameter; they hung on the World Trade Center plaza. 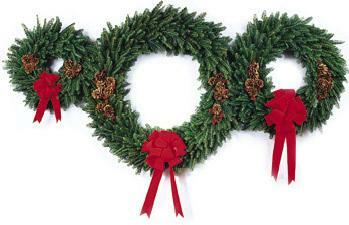 Monday through Thursday we’d work from 7 a.m. to 3:30 p.m. making wreaths. We’d stack them outside the garage to keep them cool and moist. Our workshop sat along the deep gorge along the edge of the roaring creek. The thrill of finishing another perfect wreath pushed me to work faster and harder. The oxygen rush of working with fresh greens made me a bit giggly and the days filled with laughter. We worked in teams of two. I was a cutter and buncher and I worked with a crimper. My first year I cut for Susie Nash, a veteran wreath maker and scrappy pool-shooting dart-throwing beer-drinking redneck single mother of two sons by two fathers. I had a tough time keeping up with her but the results proved spectacular. In my first year we could make 30 wreaths a day. Susie worked hard but her mouth ran every minute. The radio played holiday rock tunes. The intoxicating fragrances of pine, spruce, juniper, fir and arbor vitae made it a party. We put on our pine-tar covered aprons, grabbed a pair of cutting shears, donned our leather gloves, and made lush fresh evergreen wreaths. A different crew every year of women, young and old, looking to make some holiday cash. We’d bring our lunches and heat them on top of the wood stove. An electric percolator provided coffee for a warm-up break during the mid-morning. By the fourth year Stephanie, cousin Tommy’s girlfriend, and I partnered and I cut and bunched and she crimped 50 wreaths a day without breaking into a sweat. We’d show up on Friday mornings and work a half day until noon or when we got paid when Joel showed up with the truck. He’d load up all the wreaths we’d made all week long and Joel would head down to New York City for the weekend markets. It was the Friday before Christmas when I woke up at first light to a nice blizzard. It had snowed all night. Four inches. I figured we had today and maybe a day or two next week left to work making wreaths. I woke early and got the coffee on and walked the dogs. The snow was such that I knew I could get out the driveway. I hadn’t heard plows go by yet, but I started the truck to get it warmed up. Not much time left to get everything into Santa’s sleigh by noon today and down to New York City. Pay day. The radio news said the snowstorm was bad but the expected blowing and drifting hadn’t started yet and wouldn’t until afternoon. I ventured out in boots and insulated Carhartts. I had no problem getting up the road although the plows hadn’t cleared Buck Hill Road yet. I crossed State Route 79 and picked up Stephanie at cousin Tommy’s trailer. She had packed her lunch and some holiday cookies for coffee break, just in case this was our last day. “Really? Do you think he might not need us at all next week?” I asked Steph. “Well. I don’t even know if he’s going to really need us today, but I want to get paid,” Stephanie said. I turned onto County Route 227 and could see the plow had been by. Route 96 would be clear and we could easily get into the Village. It was so pretty. White. Four inches of dense wet snow. Just before the sunrise. No shadows. Only a winter stillness. No other traffic. I parked the truck on Main Street. We slid down the hilly driveway down to the garage and noticed there was no fire started yet in the wood stove. The snow was still on the roof and the chimney was still. That meant nobody had put the coffee on yet either. We’d planned a cookie swap. Gotta have coffee. We went inside the garage and looked around to see if there were a note left with instructions. Nothing. There were no lights on in the house. Surely Tina was still asleep. 6:50 a.m.
ZZZZZPppppp. ZZZZZZZZZZZppppPP. I rang the door bell. Mack, their dog, barked. Only once. He knew me. I didn’t hear anybody move inside. It was cold out here. Stephanie and I stood in the driveway a few minutes to see if anyone else was coming down the hill. In bathrobe and slippers Tina appeared at the door and said Joel hadn’t come back from the last trip down to the city. “He’s been selling all week and has plenty. He’s not coming back for the rest. He’ll pay you when he gets back on Monday. He promises. No work next week either. He’s got plenty of wreaths,” Tina said sadly. She looked apologetic, but cold. And not letting us inside to warm up. Trudging up the slippery and steep hill, I confessed to Stephanie that I’m a dingbat. She got in my truck and put her seat belt on. She looked over at me, and smiled. She started to giggle. I started to giggle. The two of us nincompoops are out in this blizzard and we can’t stop laughing. “I really wondered when you showed up early this morning whether you’d show up at all. I had a sandwich ready and the cookies, but I didn’t have my coat on. I didn’t think you were crazy enough to make it this far,” Stephanie said and started laughing all over again. “It’s wreather madness! We are completely delusional. We aren’t Santa’s elves,” I exclaimed. “Look in the back end, Jill. Wreather madness. Merry Christmas!” Stephanie said and I saw the half dozen gorgeous wreaths we’d made yesterday in the pickup’s bed of snow. Santa put them there.